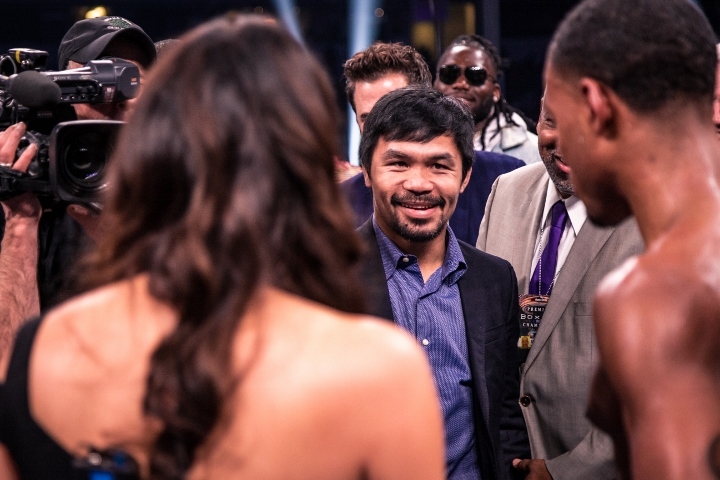 WBA “regular” welterweight Manny Pacquiao was not intimidated by what he saw this past weekend. Pacquiao travelled a long way from the Philippines, to sit ringside at AT&T Stadium in Arlington, Texas. He wanted to take a very close look at the welterweight fight between IBF champion Errol Spence and four division champion Mikey Garcia. Spence dominated Garcia over twelve rounds to win a very wide unanimous decision. Garcia, who has a world title at 135-pounds, moved up by two weight divisions to take the fight. “He doesn’t really hit that hard,” said Pacquiao to Nick Giongco of Tempo. Garcia, who entered the ring with a 39-0 record, took a lot of punishment but he was never down in the fight. Pacquiao, 40-years-old, compared Spence to Lehlo Ledwaba, who the Filipino star battered and stopped in his United States debut in June 2001. “He is like Ledwaba,” said Pacquiao said. Pacquiao is now aligned with powerful advisor Al Haymon of Premier Boxing Champions. Haymon also works with Spence, WBA champion Keith Thurman, WBC champion Shawn Porter, Danny Garcia, and several other top welterweight names. Pacquiao plans to sit down with Haymon to discuss the options on the table – for a potential July date. During the post-fight press conference late Saturday night, Spence was told about Pacquiao’s wish to fight again in July. “I can fight in July,” said Spence. But based on the buildup during the night, and in the aftermath, it appears Spence may be guided in the direction of a unification fight with WBC world champion Shawn Porter – which in turn would leave the door open for Pacquiao and Thurman to collide in a battle of WBA champions.